narrowboat_Abigail_Jenna: Which way to Oxfam? Another short trip to Lincoln for the night yesterday and moored up at the end of the Uni buildings. No noise this time so it must have been a weekend that I stayed there last. I see that the season has opened. 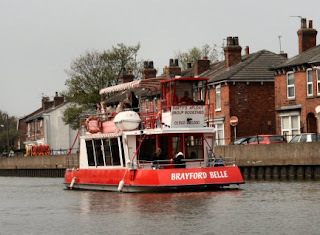 I like to see the Brayford Belle plying the canal. It makes the trip to the Pyewipe Inn and it is possible to get off there, have a meal and catch the boat to return to Lincoln. Off to Lincoln centre today to get my watch sorted out. I haven’t been able to put the extra hour on it so need to get the winder checked out. Got that sorted and made a cuppa and was just about to leave when I saw the people congregating above me on the footbridge. It turned out to be a film crew doing one of the make over programs. The boat was moored right under the bridge as the mooring was rather popular today with two boats already moored up. 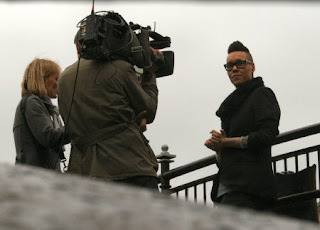 I forget his name but I have been reliably informed that it is Gok Wan and he said that he had returned to the midlands so there you have the excitement for today. He didn't offer to do a make-over on me but did point out Oxfam down the road!! Shopping done it was on to Stamp End lock. As I raised the guillotine another boat came up the lower end of the lock. ‘Friendship’ crew were kind enough to operate the lock gates (after I had closed the guillotine of course) and let me out which speeded things up no end. I reached Washingborough in the rain and hope to cycle back into Lincoln tomorrow to try out the Water Rail Way.